Looking across Gilbert Boro’s Sculpture Grounds towards his own Studio 80, the sculptures shown in the photo are all by Boro himself. 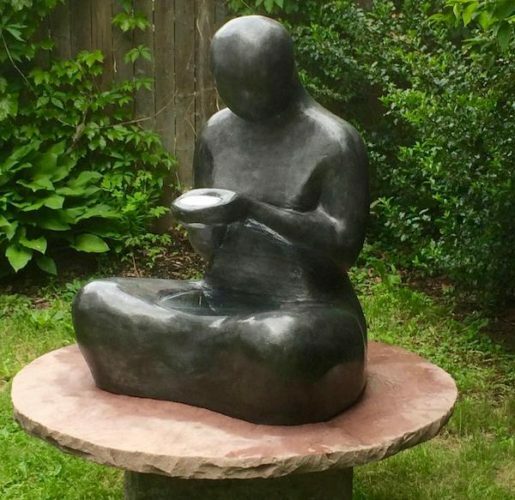 OLD LYME — Gilbert Boro, owner and curator of Studio 80 + Sculpture Grounds in Old Lyme, will host Summer Sculpture Showcase 2018: An Exhibition of Unique Landscape Sculptures on his property in the center of this historic town. Boro’s towering studio is also on the beautiful four-and-a-half acre landscaped grounds, as well as his home. Featuring 20 works by both established, nationally renowned sculptors, as well as fresh new faces, the summer-long show opens June 4. A meet-the-artist opening reception is set for Saturday, June 9 from 5 to 7 p.m., which will feature a live jazz band and a performance by David Dorfman Dance. There is no charge for admission and all are welcome. Competition to exhibit was keen, with 120 submissions from around the country. Entries were evaluated for concept, execution, creative process, artistry, and how it would fit in the landscape. Boro, a nationally acclaimed sculptor in his own right, hosts this annual show to provide a venue for both young and mid-career sculptors to showcase their work to a diverse audience. The exhibitors accepted for the Summer Sculpture Showcase embrace this concept. Acclaimed exhibitor artists from Connecticut, the northeast region, and around the country are represented in the show. ‘Lustration’ by Sarah Haviland is one of the features works in Summer Sculpture Showcase 2018. New York sculptor Sarah Haviland, who received a Fulbright Award to study in Taiwan this fall, had two pieces selected: Lustration, a contemplative female figure of aqua resin and mirrors, and Seraphim Mirror, a butterfly-shaped wall hanging created with galvanized mesh, resin, and a mirror. Haviland’s abstract work explores female identity and is exhibited both nationally and internationally. Aether by Andreas von Huene is on display at Studio 80 + Sculpture Grounds. Miguel Castillo Hernao, a native of Colombia, evolved to sculpting after university studies in literature and philosophy. Hernao explores geometry, color and repetitive forms in his works composed of stone, wood, metal and plexiglass. His seven-foot tall entry, Composition #28, is formed of painted riveted aluminum. 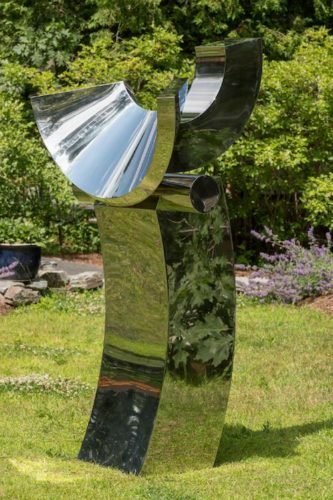 Chicago artist Ruth Aizuss Migdal’s bold and striking Radiate, standing more than eight feet tall, also plays with female forms and is composed of patinated bronze gilded with gold leaf. Connecticut-based artists include Deborah Hornbake, whose Running Man is a fusion of wood, pipe, copper tubing, wire and stones; Eric Camiel, who has works in the permanent collections of the Museum of Modern Art and The Library of Congress, and whose film work has received numerous Emmy and Academy Award nominations, will have his aluminum sculpture, Sail Dream, on display; and Denis Folz’s monumental 11- foot steel sculpture, Feathered Resting Spot. Boro is committed to supporting and exhibiting promising new artists. This year he presents Shelli Weiler as the featured indoor artist, with her photography exhibit titled Intimate Exchange. Weiler, a native of Scarsdale, NY, is studying photography at Wesleyan University in Middletown. Her photography explores the deep hidden character of people through ground-breaking and provocative poses and settings. Boro is presenting her work in the small, freestanding ESB Gallery, created in honor of his late wife, Emily. Situated halfway between Boston and New York, Summer Sculpture Showcase 2018 is set on Boro’s four-and-a-half acre estate in the heart of Old Lyme’s historic village. In addition to special exhibits, the permanent display consists of approximately 100 works strategically placed around the park-like grounds. 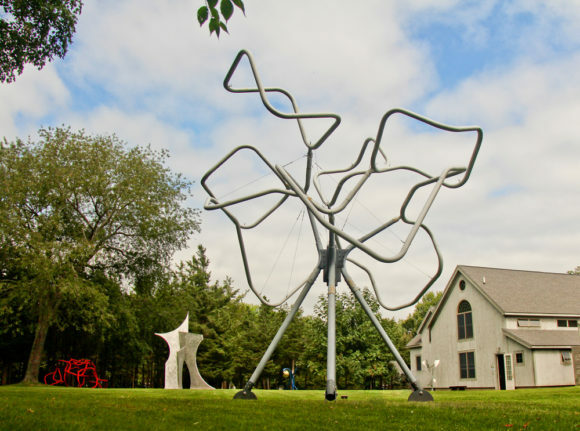 Now in its 14th year, the Sculpture Grounds host more than 5,000 visitors a year. Visitors are welcome to bring their own picnic to the cafe. The grounds are open 9 a.m. to 5 p.m. daily, year-round, admission is free, and touching the sculptures is encouraged. The show runs through Oct. 26 and is curated by Gilbert Boro, and Exhibitions Coordinator and photographer, Christina Goldberg. For more information about Studio 80 + Sculpture Grounds, visit www.sculpturegrounds.com. The David Dorfman Dance group performs and holds workshops around the country and will be in residence at Conn College in New London June 6-11.